I’m sitting in a different cyber café in Dakar. This one is cheaper – remember that I don’t have a job – and there is less background noise. I entered the Mauritanian part of the Sahara desert. I drank 14 litres of water in one day. 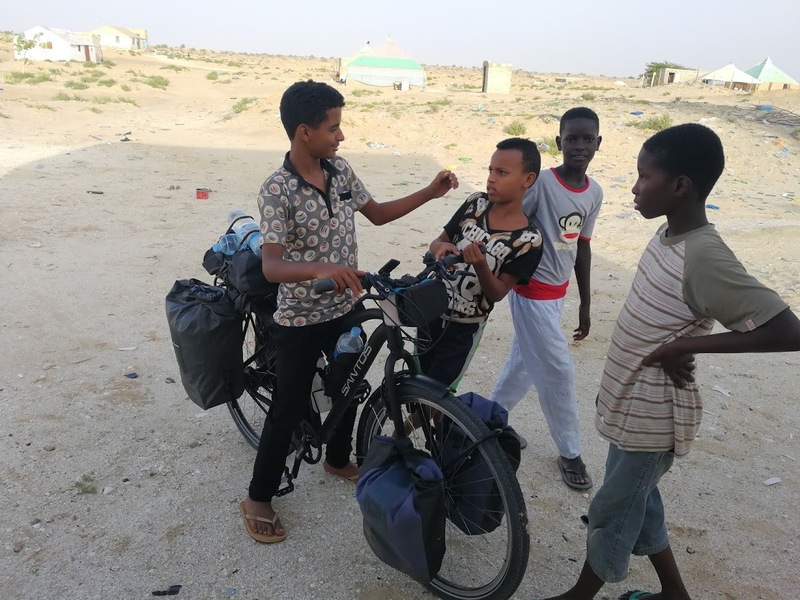 I caused some concern among travellers along the 500km long “Nouadhibou -Nouakchott Corridor”. I almost cried in my tent because I was sick of all the sand. I was “detained” by Mauritanian police on three occasions. 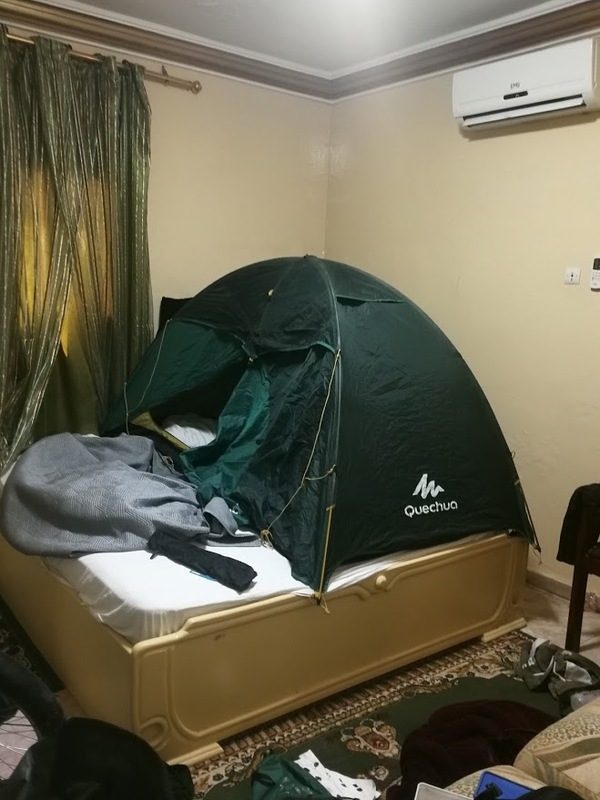 I camped on a hotel bed in Nouakchott. A shaky boat helped me across the Senegal river into Senegal. 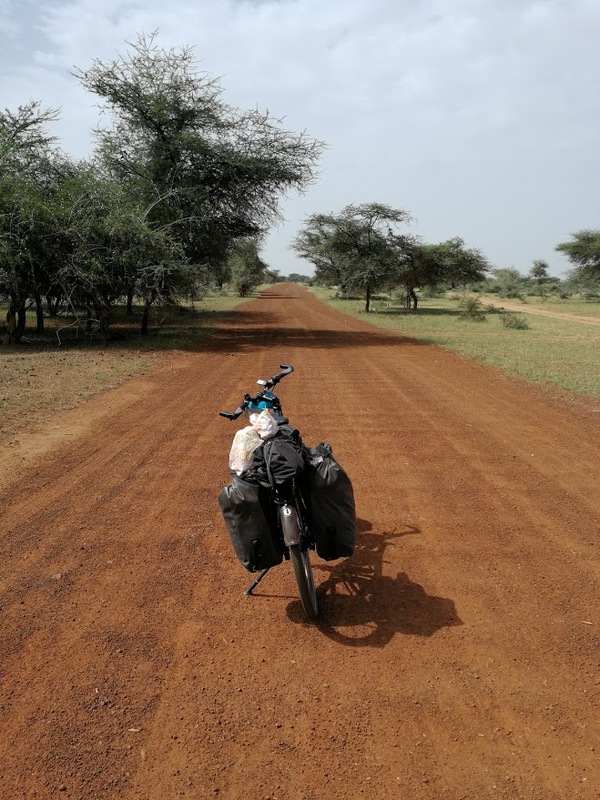 I completed Damme – Dakar: 6567km on a bicycle. 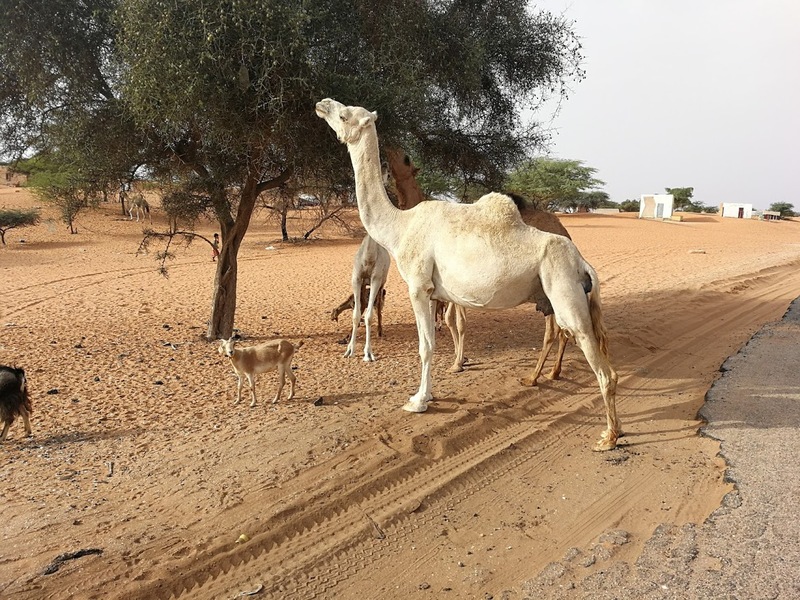 Let’s pick things up where the last blog post ended: In the “no man’s land” between (Moroccan controlled) Western Sahara and Mauritania. 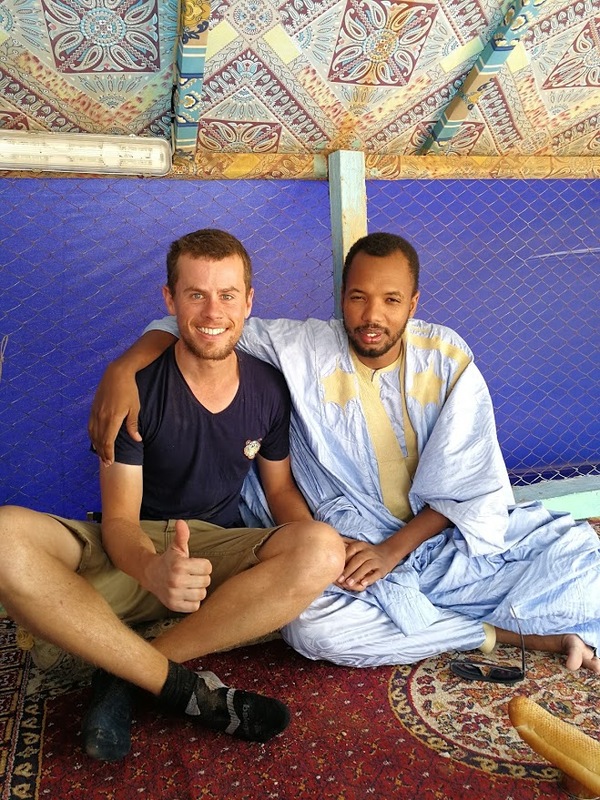 After 4km of broken cars and tires, I arrived at the Mauritanian border post. Entering the country was very easy: 55 euros for a visa, some basic questions about what I was planning to do, cracking a couple of jokes at the customs post… done. clearing customs – a piece of cake! 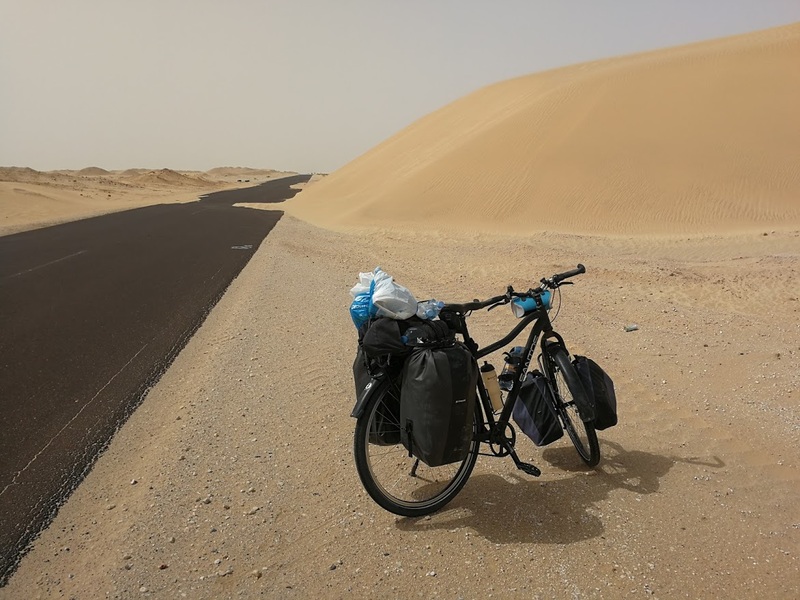 Two hours after leaving the Moroccan exit point I was already cycling down the “Nouadhibou – Nouakchott corridor”. This is the only real road in the Sahara desert in eastern Mauritania. 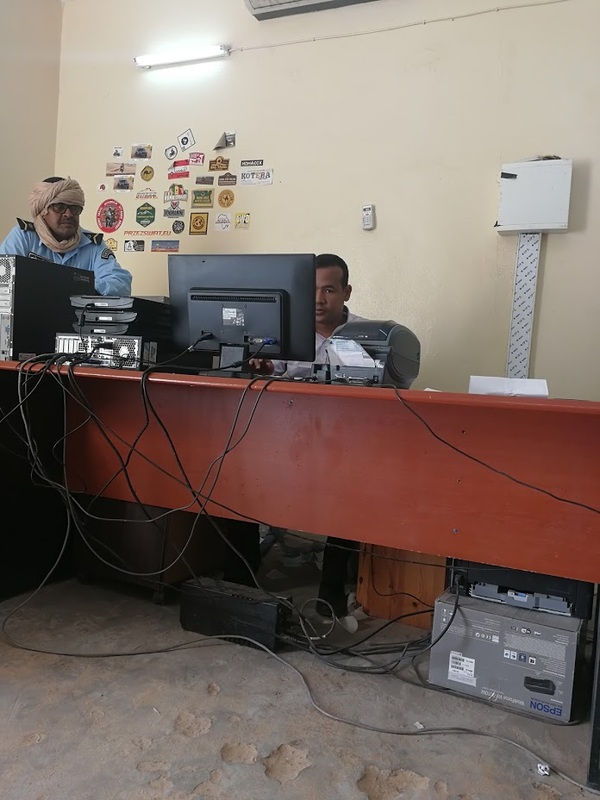 It connects the two main cities, Nouadhibou and Nouakchott, and is highly secured. 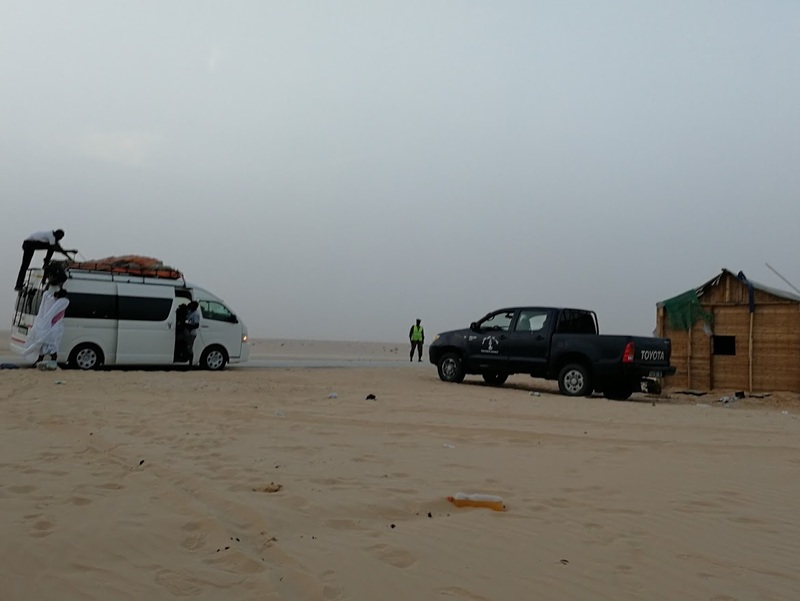 The desert police has check points every 80km’s, and they check every car 24/7. During my first day in Mauritania the weather conditions changed drastically. The temperature went up by 20°, to 43°C at 2p.m., and the wind changed direction. 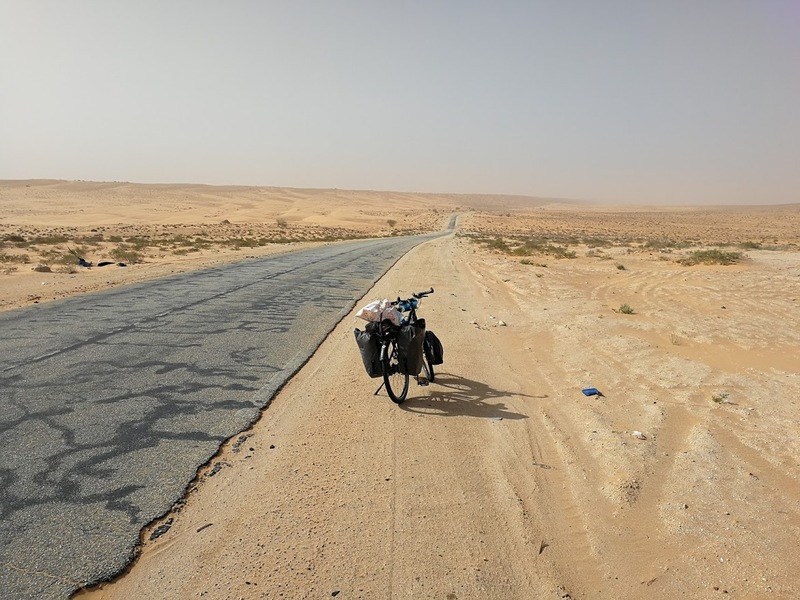 Although it had been relatively easy to cycle 160km per day in the Western Sahara, it now felt like I was on a broken treadmill in a sauna. 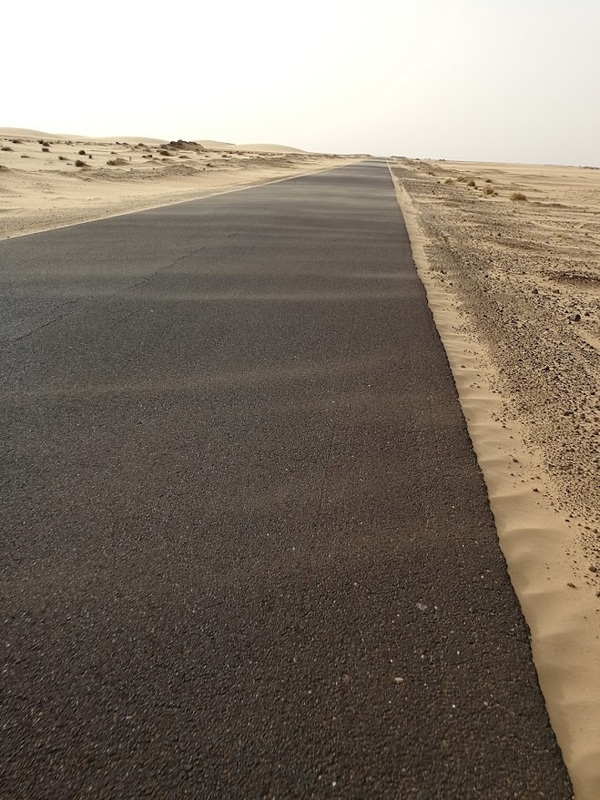 To make matters worse, the strong headwinds picked up desert sand. This resulted in a continuous “sand scrub” of my ankles and calves. sand flying over the surface of the road. I had 16 litres of water on me in the morning. I had bought a lot of water the day before, because the first village is 250km South of the border. However, by 1pm on that first day, after merely 25km, I was already down to 9 litres. My average speed was below 10km/h so I started to worry about running out of water. 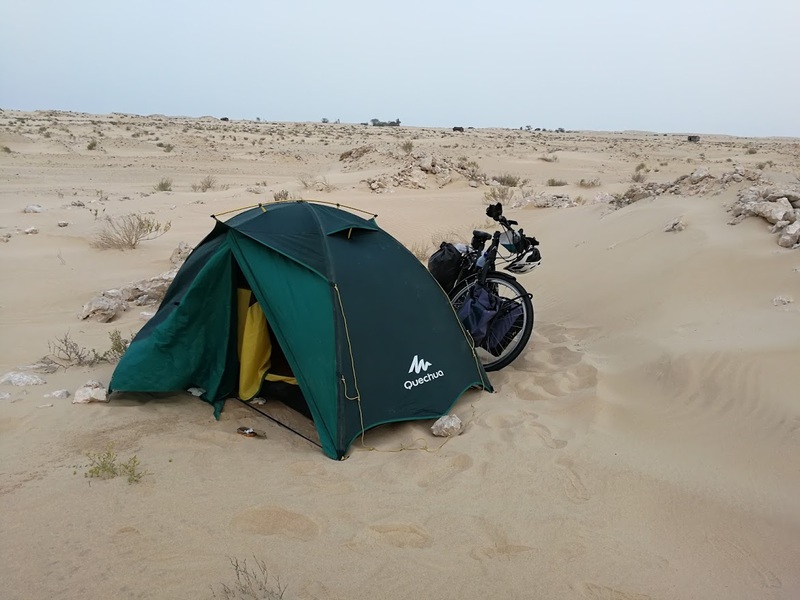 Do you know you’re cycling in the desert? Yes, I am very aware of that. Do you know Nouakchott is still 450km away? You can get in the back of our pickup truck. Yes, I am aware of that. 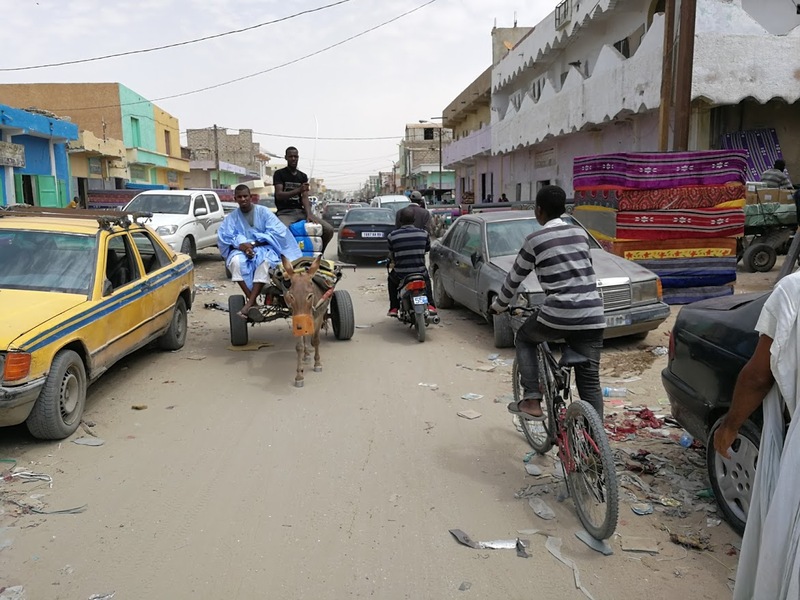 At this point my life goal is to get to Nouakchott on this bicycle. As you wish, but at least grab some water. Everyone seemed very surprised to see a bicycle appear in the middle of the desert. I could see that they were still confused even after I explained what I’m doing. Almost all cars carried water, so I didn’t have to worry about dehydration anymore :). I’ve been using my WoMena shirt for alternative purposes. 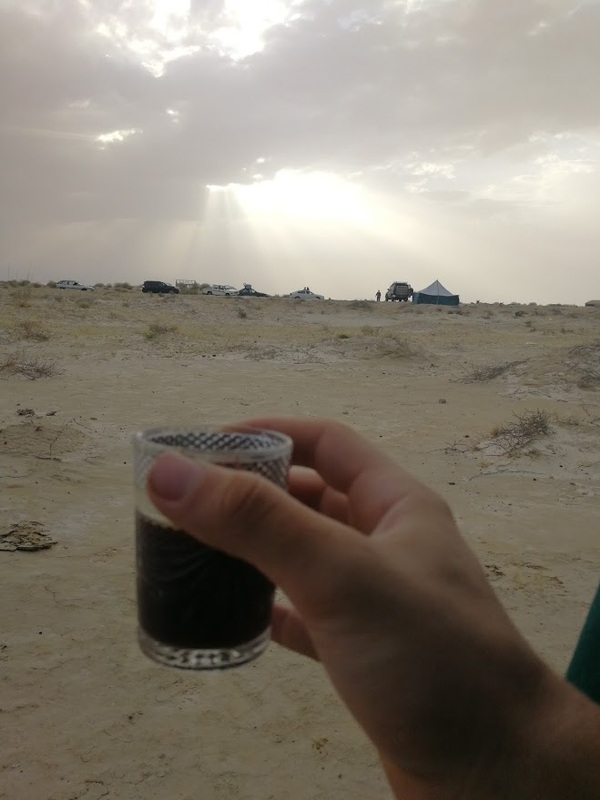 I camped wild in the desert sand for two nights, and it was hard. There were gusts of wind at night, and there was sand “snowing” down on me. 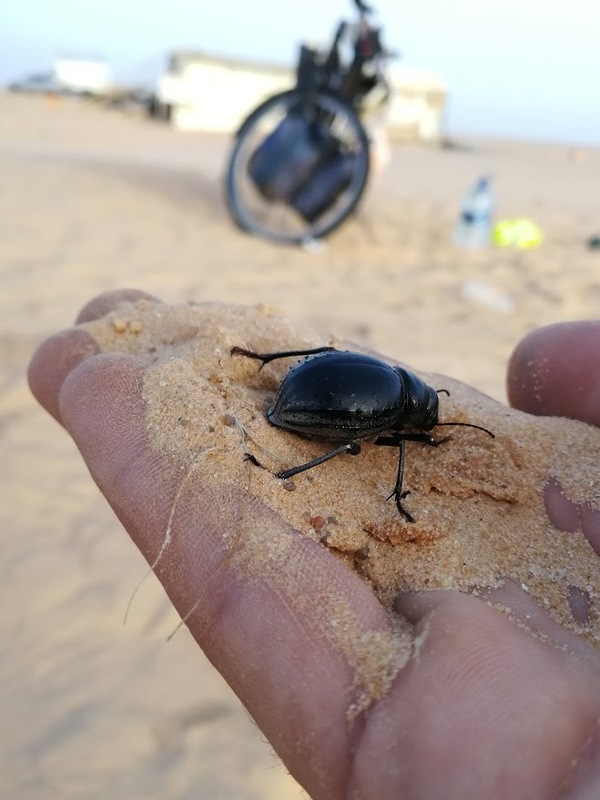 I woke up every hour or so to get sand out of my ears… Also, because I was sweating a lot during the day, I started to get cramps in my legs at night. On the third day, things started to go a little better. The wind had disappeared, and I had learned to cycle in a more energy efficient way in the 40°C heat. By cycling slowly, I didn’t sweat as much, and the cramps disappeared. At the first police check point that day, the officers told me they knew I had been camping wild, and they were not too happy about it. “You must be the Belgian guy cycling to Nouakchott”. “you’re being detained, we don’t want you to camp wild anymore”. “You can set up your tent in our sight, we’ll let you go in the morning”. This happened three times in total. I didn’t mind at all. The “chef de poste” would always invite me to sit down next to him, on a blanket in the desert sand, and they always had good food and tea :). I even had turtle! 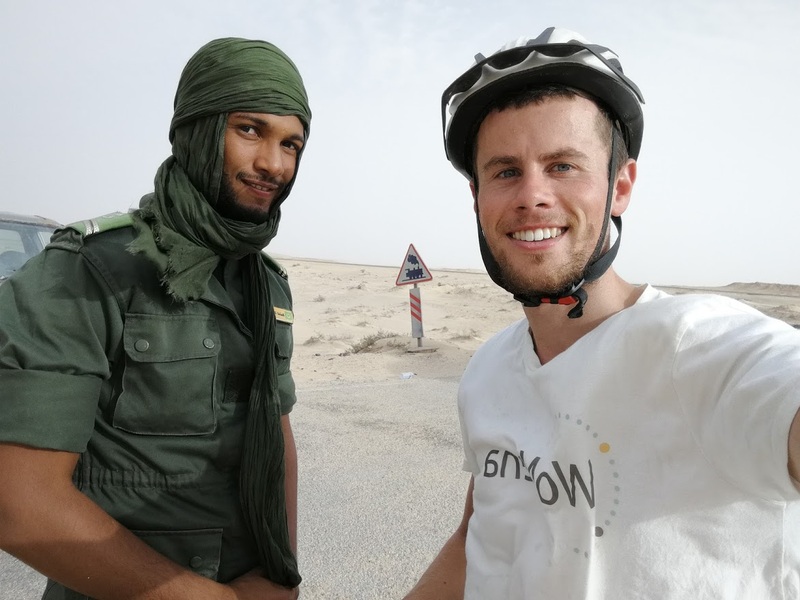 This seemed to be the unspoken deal between me and the Mauritanian police: I didn’t whine when they told me to stop, and in exchange I could join for free food and tea. “poste de police” checking a bus of travellers. 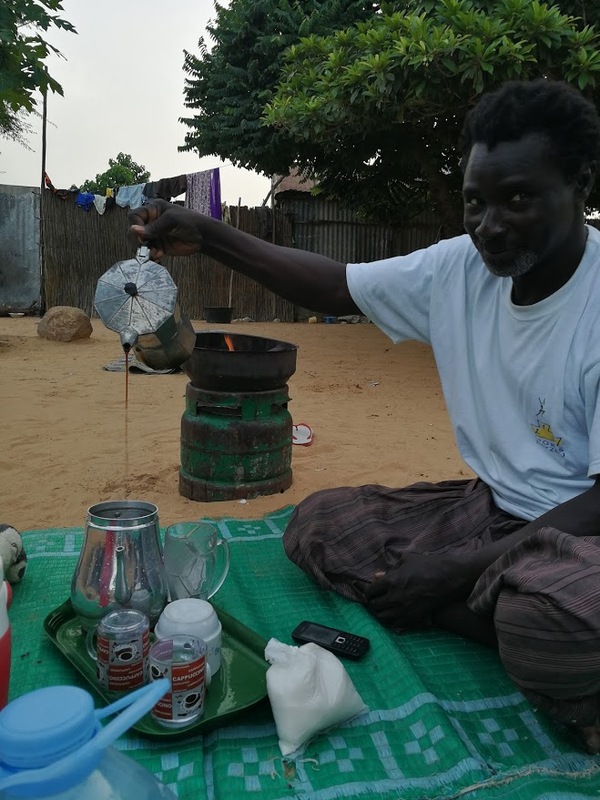 During the last 100km before Nouakchott, I was invited a handful of times to have tea in the tents along the road. Here’s a picture of Omar wearing a “darra”, the traditional outfit worn by Mauritanian men. 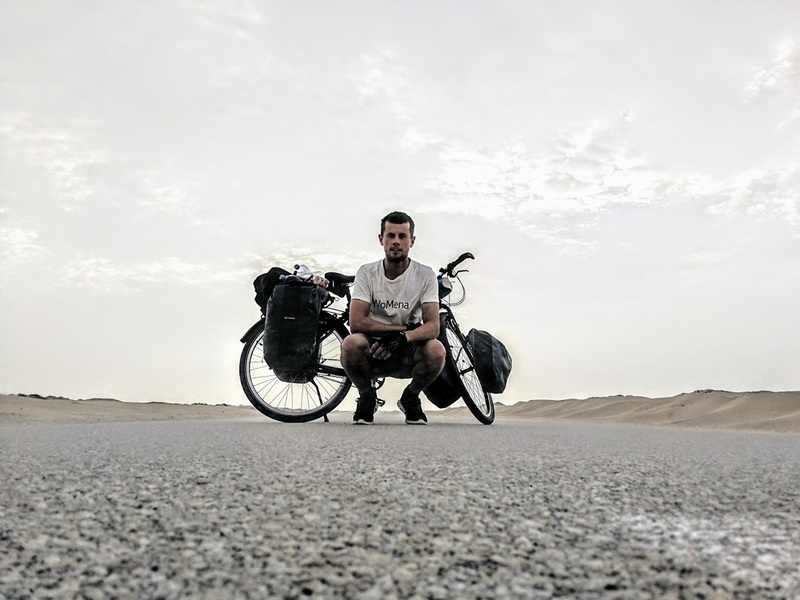 By the time I cycled into Nouakchott, I was a dead man walking (cycling?). I had never been so tired. I got a room in a hotel for two nights that was full of mosquitoes. I ended up putting my tent on the bed. Despite this, I was feeling happy. 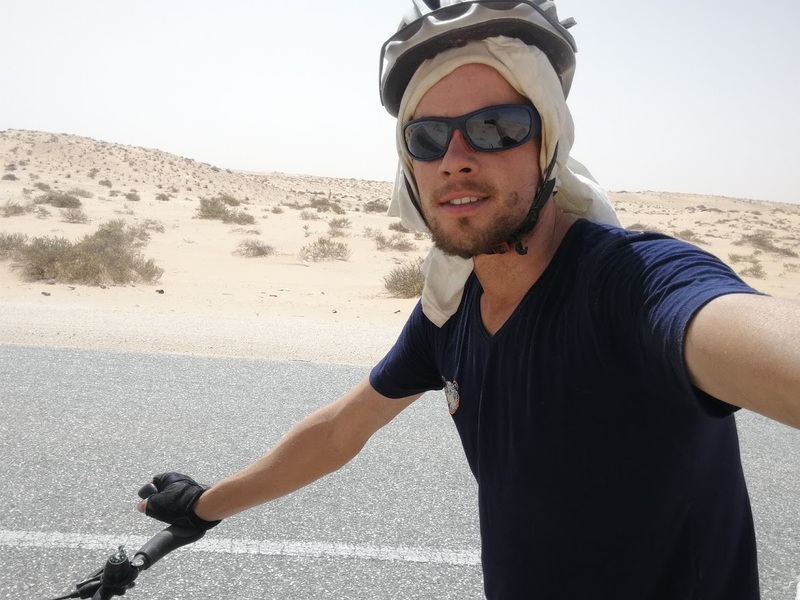 Cycling across the Sahara desert was an amazing experience, and I’m so happy that I can brag about it for the rest of my life. Despite the sand in my ears at night, I will mostly remember the love I felt out there. One encounter has been replaying in my mind ever since: a Tuareg man drove up next to me in his car. He didn’t say a word. He just nodded, smiled, patted me on the back, and handed me a bottle of water before driving off again. 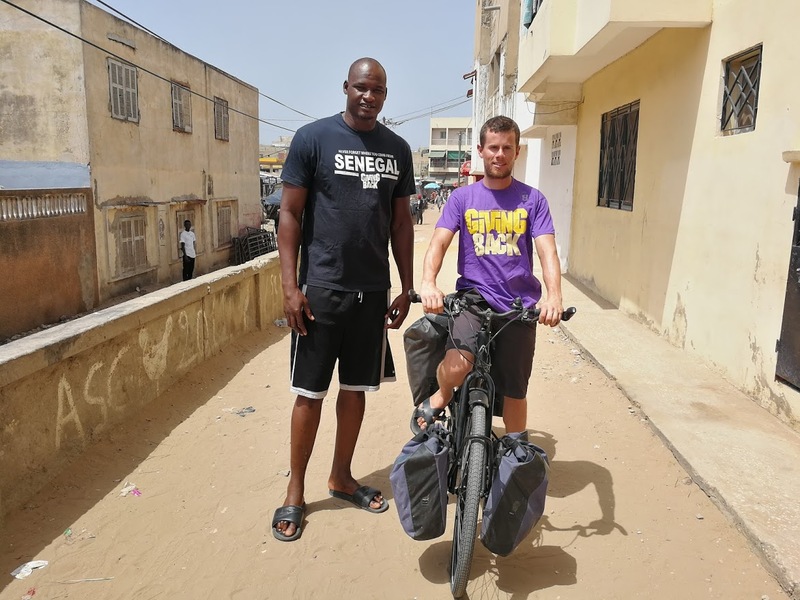 After two nights of rest I cycled towards the border with Senegal. 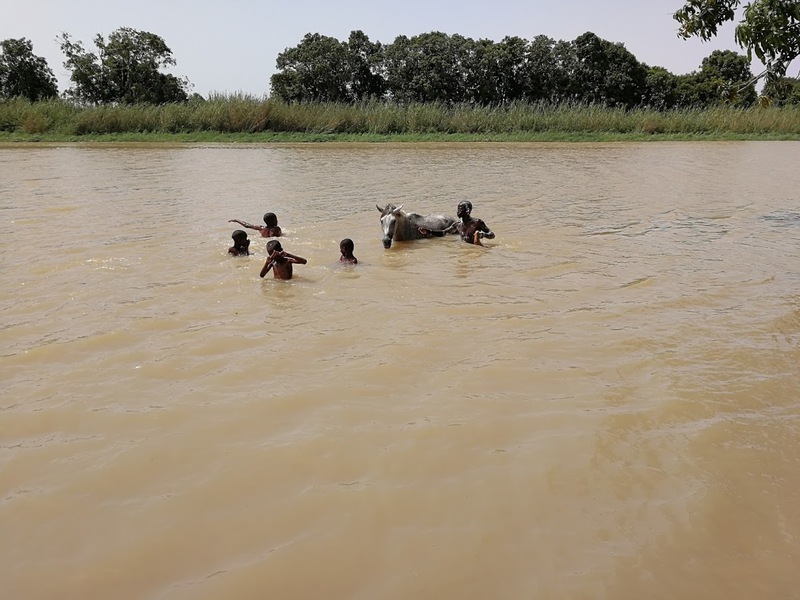 Most people in Mauritania live South of Nouakchott, so I had no issues finding water and food along the way. I hung out with kids when I stopped to buy food. I even had to break up a fight over “who can ride my bike first”. 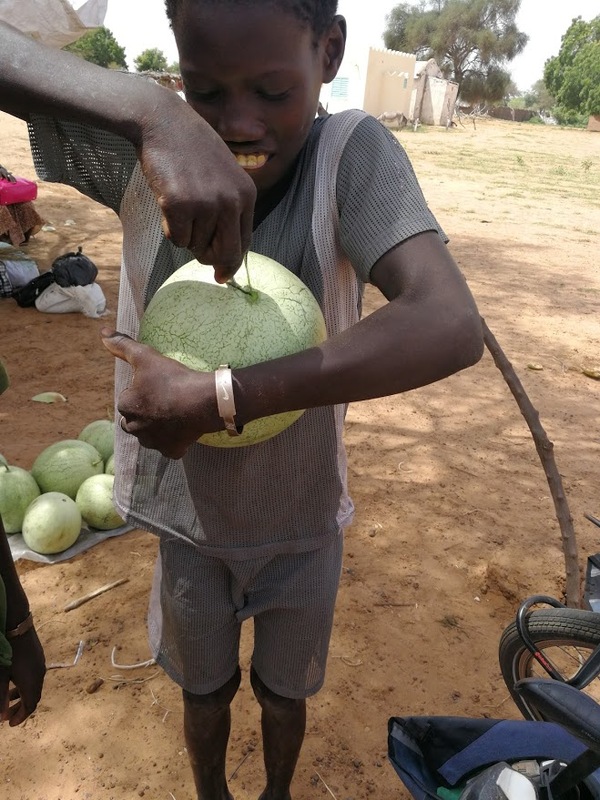 250km South of Nouakchott, I crossed the border – in a shaky boat – into Senegal. The border seemed disorganized, and I wasn’t sure why I had to pay again and again. To leave Mauritania (why do you need to pay to leave??? 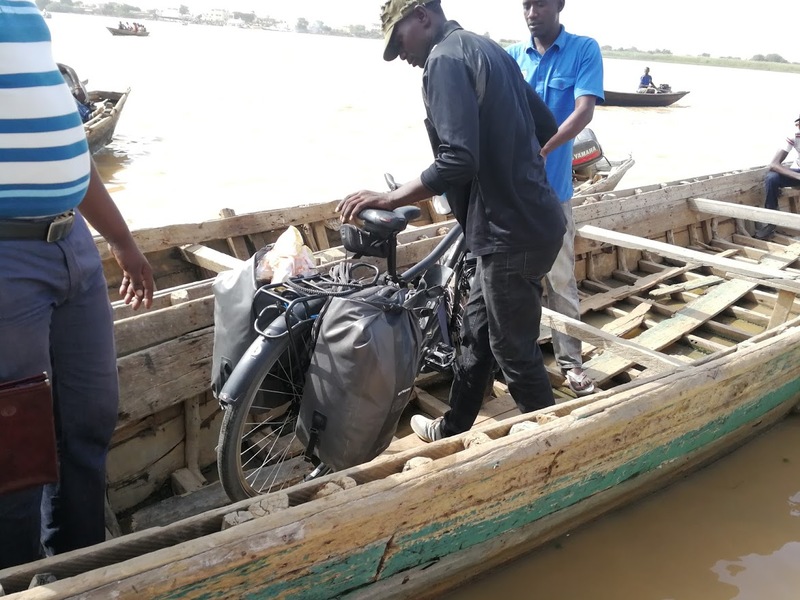 ), to “register” the bike, for “service”, for the little boat, for the “guard” who looked after my bike while I was in the customs office… None of the border officers were helpful at the Mauritanian side, they just wanted money… I spent 150 euros in total. The change of scenery in Senegal was just what I needed. After weeks in the desert, the sea of green made me smile all the way to Dakar. 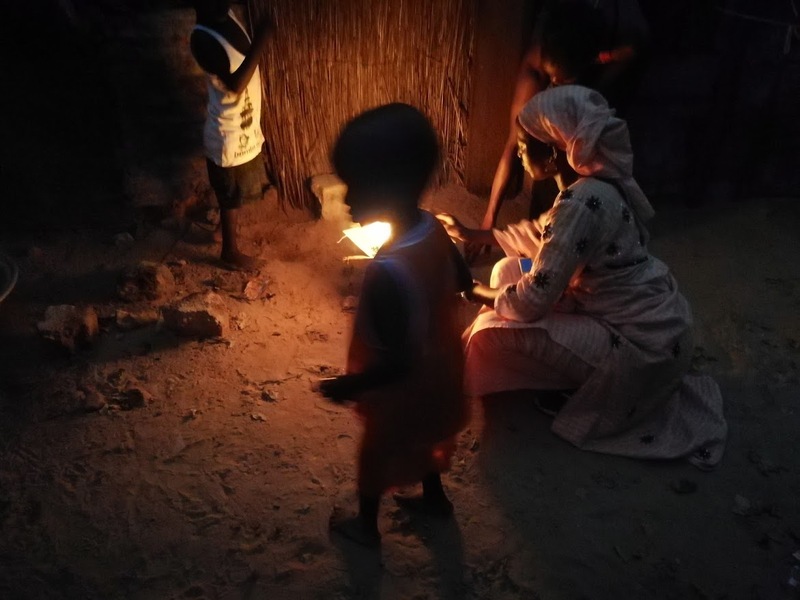 On the first day in Senegal, I was – positively – surprised that women talked to me. I had grown accustomed to only engaging in conversations with men, as women in the desert are rather difficult to approach. 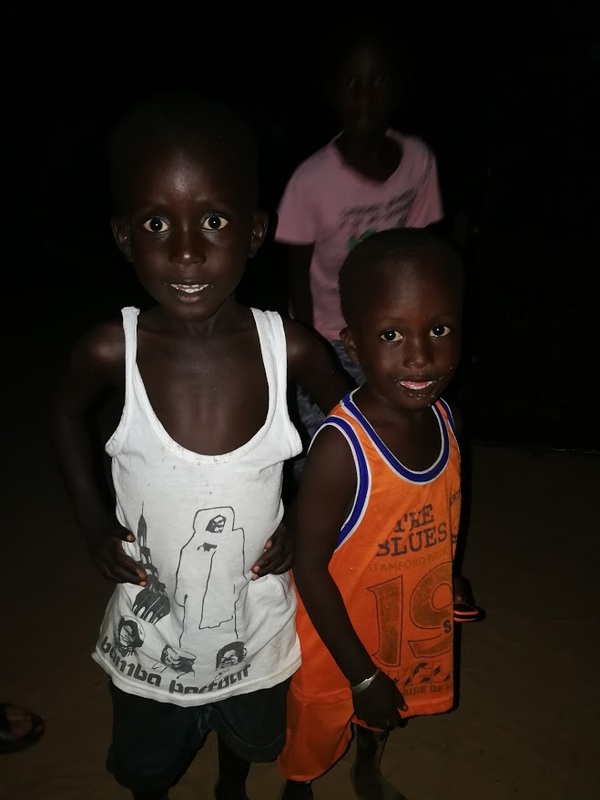 On the second day in Senegal, I was invited by Gabriel and Seynabou to camp in their garden in a town called Ndande. The whole family joined for dinner, including their 8 grandchildren. Gabriel also re-introduced me to an old addiction of mine: coffee. 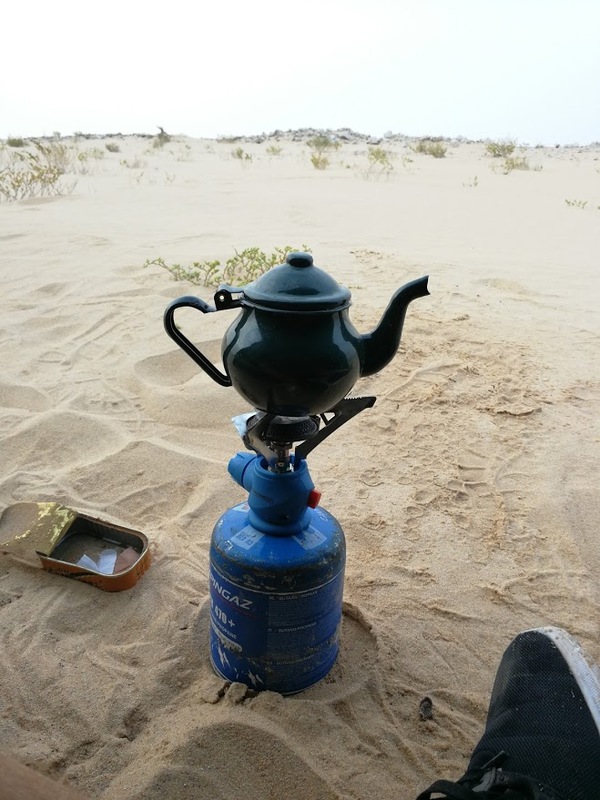 (Only tea in Mauritania). In Dakar, I dropped off my bike at Maha’s place. Maha is a basketball player who’s involved in an organisation called Giving Back. They support talented kids who dream of becoming basketball players. Giving back guides them on their journey, and helps them get through school. Maha’s taking care of my bike while I hang out with three Belgian friends of mine who are spending their holidays in Senegal. 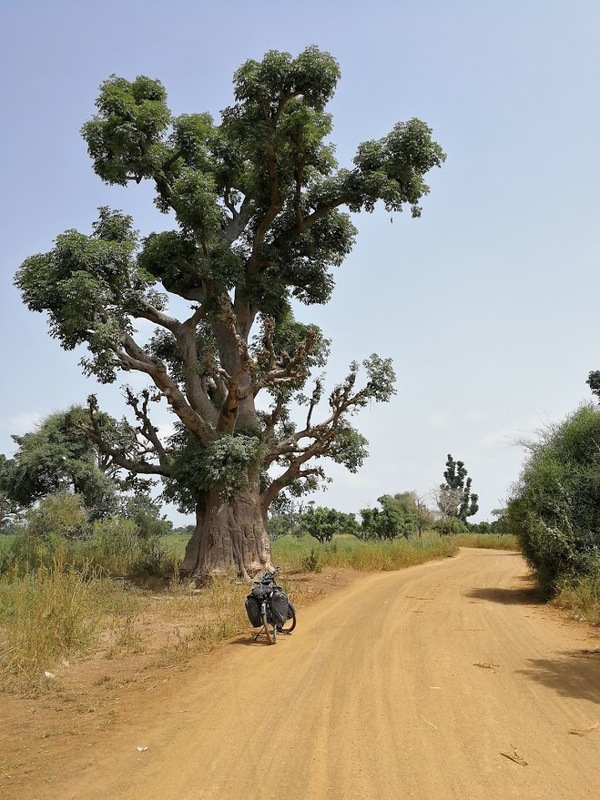 After that, I’ll cycle towards Bamako! We may never meet, but I’m with you all the way! Reading about your trip makes so many memories come back of days and nights in the desert – the desert sky at night is just one of them. Wishing you all the best and keep the trip news coming. Be safe! bedankt voor je bericht. Heb een post over BOA online gezet. en « bon vent.. sans trop de sable ». Bedankt voor jullie bericht. Ik heb het nog steeds naar m’n zin op de fiets. ook voor jullie het beste gewenst! Magnifique expérience. All the best for this wonderfull Journey. in dat geval krijg jij het eerste exemplaar alleszins cadeau :).